This past week was difficult, but with determination to keep moving forward, I finished this latest piece, Stack o’ Jacks. I designed this on commission for a friend and I really enjoyed hooking it in a painterly style. 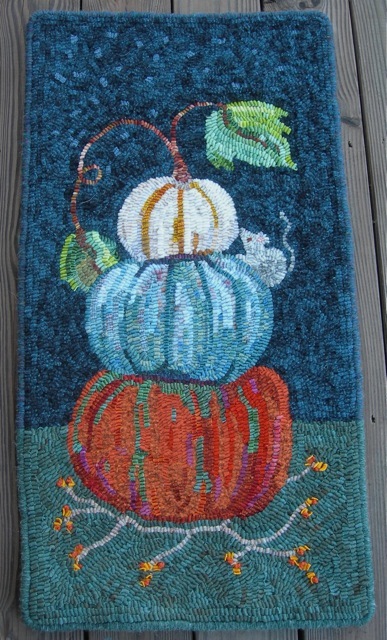 The blue gourd is my favorite, but the others have a variety of colors and strip widths to give them character. Using colors that don’t all “go together” adds excitement and interest. I used a beautiful dark blue wool for the background, but felt that it needed just a bit of something in the upper left corner, so I inserted some “confetti” using wool in a lighter blue value. It helps to balance the design and keeps the eye traveling around the piece. 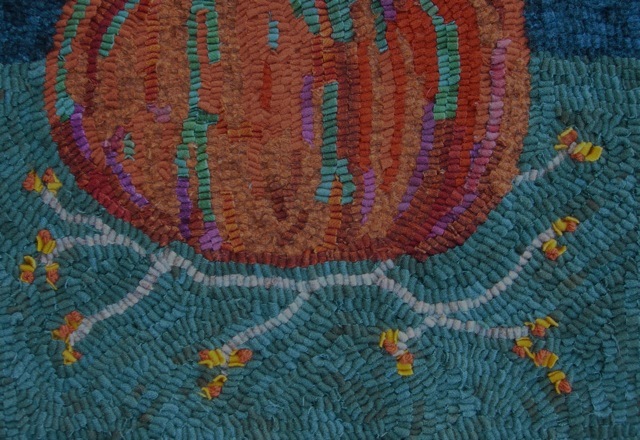 The bittersweet in the lower area of the design was done by using a bright school bus yellow wool in a wide cut and then doing French knots with a dull orange yarn. I love how it came out. This is a wall hanging so adding other techniques is possible, because it won’t be subjected to foot traffic. Or cat claws. Sabrina the cat lives where this wall hanging will call home. I will get this design added to the Shop page of my website very soon. It can be ordered before then by contacting me through my website. I’m up in the air about what to hook next. I am struggling with my design for the super secret rug. I have an idea, but am not sure how to depict it. This is providing me with some good brain stimulation. And maybe a few sleepless hours in the middle of the night, but that's nothing new. There’s a lot of beauty out there and in moving forward when life is difficult. Stack o' Jacks finished with a simple whipped edge. A close up of the bittersweet.